In what resembles a physician's exam room, David Russell sits. His ears are swabbed with antiseptic first. A taper (large needle) is slowly pushed through his left ear lobe. His lobes were being stretched by his wife, Tam Russell, owner of Redemption tattoo studio. Soon after the piercing, studs are implanted, filling the newly formed holes. His body, covered in tattoos, is further modified. The next day, Russell will button up his shirt, slip on some slacks and head to work, as a systems analyst in the corporate world. Are Russell's tattoos still a taboo in the workplace? Some say the stigma is gradually lifting. As younger generations of employees emerge, body modifications such as tattoos and piercings are, now more than ever, openly seen in the workplace, said Mike Letizia, president of the San Joaquin Human Resource Association. The retail industry is known to be more accepting of the body alterations, he said. Don't hide that tattoo anymore! But Letizia doesn't believe America is ready to see bankers, mortgage agents and office managers with pierced faces just yet. These things are usually eliminated from a company environment with a dress code. In a professional setting, clients are more likely to be turned off by the display of body art, he said. "You just have to keep in check how it is affecting customers in your business," said Letizia. Kirk Salazar, a 29-year-old local retail store manager, agrees. Salazar, who wears lip rings, tattoos along his arms and has stretched ear lobes, has been in the retail business for 11 years. He is able to show off his body art in his current job, a specialty store, where rock shirts and gothic clothing are sold. But he recalls hiding his body art in the past, in order to pass interviews. "Because I know that the average store doesn't really accept it," said Salazar. "People get the misconception that you have a bad personality. It's like, 'Man he's freaky.' But it has been more accepted now than it ever has been." Open Door Service Inc. has a policy stating employees cannot wear long jewelry, but they have no policy prohibiting employees from wearing facial jewelry or tattoos. The organization provides behavior management and life skills training to developmentally disabled adults. "We do have some employees who have things like body piercings and tattoos," said Cherie Sintes, the company's human resources manager. "You may see more people with piercings in this field than any other," said Sintes. People like 19-year old Kimberly Somera of Manteca, who guides about four adults in their everyday learning. Somera dyes her hair black, sports Converse shoes and has a facial piercing. And while in outings with her clients, "They see my clients with developmental disabilities, then they see me. I will wave at people (as they stare). It doesn't bother me." All of this raises the question: Is it discrimination to deny employment for body modification? 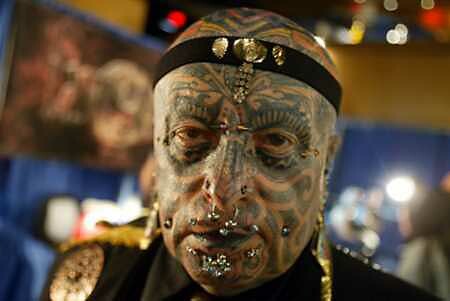 "Piercings and tattoos are not a protected class," said Letizia, from the human resources association. But "a wise employer would not say 'I can't hire you,' rather ' I would be happy to hire you, however, you must cover the tattoo or remove the ring while you are at work." In many cases wearing rings, which can be easily ripped off, is more a safety issue for a company, said Jayne Howland, human resources manager with Heritage Plaza Mortgage in Stockton. The company's main reason for not allowing it, however, is to maintain a professional appearance. Body modification has long been a practice or ritual for primitive cultures throughout the world, but has steadily made its way into mainstream American. Currently, there are more than 15,000 tattoo studios in America, according to U.S. News & World Report, which said they are one of the fastest growing retail business categories in America. "Tattoo artists, who have graduated art school, end up going into tattooing because it's a lucrative business," said Tam Russell, the owner of Redemption tattoo studio on Main Street. Russell has been tattooing and piercing for 16 years, being one of the first female tattoo artists in Stockton. "It has also become more acceptable for women to tattoo. They used to be really rude to me because I am a woman," said Russell. Television shows such as "Miami Ink" and "Inked" have triggered even more interest in the practice, said Jeff Hardcastle, owner of Nothing Sacred Tattoo on California Street in Stockton. The menu of body modifications has evolved, as well. For example, branding has become increasingly popular said Santiago Roxas, a Stockton tattoo artist and body piercer, who performs the branding procedure with a cautery machine. Although he is currently out of commission, due to surgery, his wife, Brandy Roxas, took over branding operations for the time being. Santiago also performs a number of other procedures including transdermal and micro dermal implantations. And one of the newest crazes is eye jewelry: small jewels that are implanted on the eyeball by an ophthalmologist. A tattoo can cost anywhere from $50 for a small flower to several thousands for a large back piece. For a piercing the cost ranges from $30 to $60, sometimes not including the cost of the ring. Other businesses have spurred in order to correct some of the inflictions. California Skin Laser Center in Stockton takes anywhere from four to eight patients per month for laser tattoo removal. The cost to have a tattoo removed starts at $200 and increases depending on the tattoo size. The method is painful. It takes at least five procedures to have a tattoo removed. Through the treatment ink is broken down by the laser and reabsorbed by the body. Body jewelry companies also sell clear and skin-toned retainers to keep piercings open, while the jewelry is removed for things like a job. With the popularization of the body adornments, some local shop owners urge people to be precautios. "It's a cultural explosion at this point," said David Russell, who owns Redemption shop with his wife. "The bad thing is any kid can make a tattoo gun an open a shop," said Santiago. The field of piercing and tatooing is loosely regulated by health boards and governments. Rarely are there certification requirements. In addition, practitioners rely solely on apprenticeship for education. "There is a lot of bad publicity about fly-by shops in Stockton," said Hardcastle, one of the shop owners. "There are some really great shops in Stockton, but you have check them out and make sure they are reputable."